Natures Menu Country Hunter Dog Food Cans (Succulent Duck) is a premium meal filled with top quality raw ingredients, sealed and then steam cooked to lock in all the goodness. 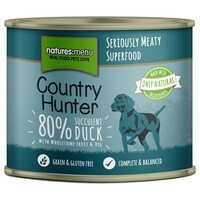 Made with 80% Duck and a generous portion of wholesome superfoods, fruit and Root Vegetables, Natures Menu Country Hunter is a complete and nutritionally balanced meal packed with delicious ingredients and essential vitamins and minerals. Containing no nasty meat meal or derivatives, artificial colours or flavourings, the cans are a great alternative to raw feeding when travelling or staying away.